Today is a momentous day. It marks the beginning of a new paradigm: the day the President of the United States affirmed that the only way to stop the worst impacts of climate change is to leave fossil fuels in the ground. We did this, all of us. Together with years of effort and activists across the continent we stopped this pipeline from being built. The movement brought us to this point. People power beat out the money of Big Oil. This will not be our last fight, but for a moment, one golden well-deserved moment, we should celebrate. Because without our sacrifice, without our passion this would not have happened. 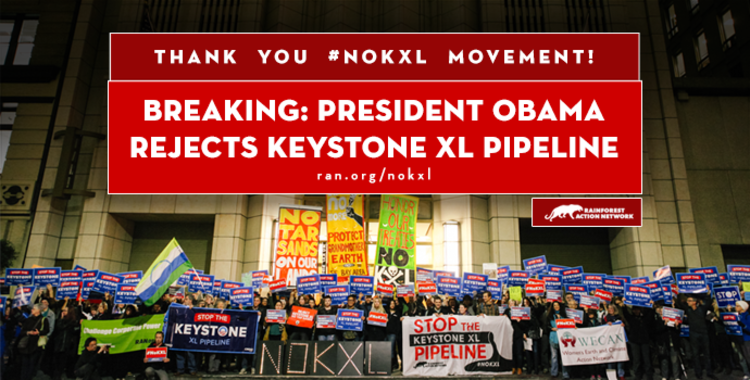 And now, President Obama rejected the Keystone XL Pipeline. RSVP to a rally near you to celebrate. If there's not one near you, go here to create one.